Recreate the look of commercial ceiling paints for less by picking a regular paint with ceiling-friendly properties. Q: I’d like to repaint the gray drywall ceiling in my study a fresh white to brighten up the room. Are the pricier products labeled “ceiling paint” really the best paint for ceilings, or is there is a cheaper option? A: While the label “ceiling paint” might have you believe that it’s the only viable paint for ceilings, this specialty paint (starting at $15.98 per gallon from brands like Valspar, available at Lowes) is nothing more than regular paint formulated with a viscosity, sheen, and color options that allow for a drip-free ceiling painting process and a low-key look that is desirable on ceilings. 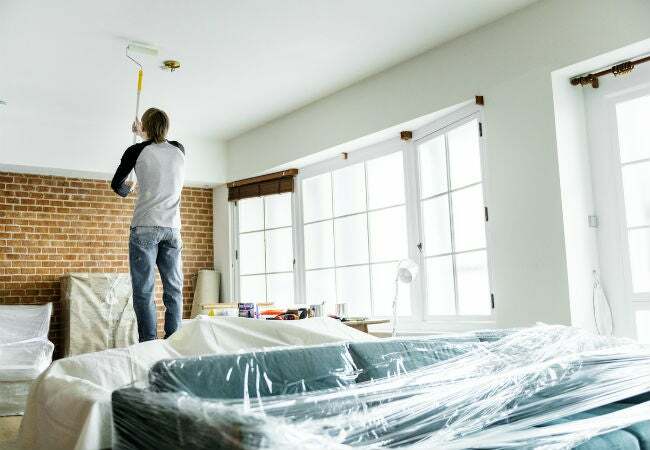 These pricier paints will certainly get the job done well, but, to save $2 to $3 per gallon, you can opt for a regular paint with the mix of properties found in ceiling paints. Keep reading to learn what type of paint and primer you need to achieve a polished, pro-quality ceiling paint finish. Start with an interior latex primer. Priming is always recommended when transitioning from a darker to a lighter ceiling paint color; it will improve paint adhesion and prevent the darker old coat from showing through the lighter new coat. Before you paint over a smooth or lightly textured (e.g., knockdown texture) drywall ceiling, prime it with an interior latex drywall primer like Glidden Latex Drywall Interior Primer (available at Home Depot) that’s close in color to the paint. Choose a high-build primer like KILZ High-Build Drywall Primer (available on Amazon) if your ceiling has a deeper texture (e.g., popcorn)—these products not only prime but also fill in grooves and imperfections in the ceiling. Choose an interior latex paint. While oil-based interior paints cure into a harder, more ding-resistant coat that makes them ideal for high-traffic spaces, the less expensive interior water-based latex paints (starting at $13.98 per gallon from brands like Valspar, available at Lowes) are sufficient. After all, ceilings are seldom touched, and as a result, see less daily wear-and-tear. Latex paint also has a quicker drying time and emits less volatile organic compounds into the air—which is an important consideration for an indoor paint job with insufficient ventilation. Plus, it provides better resistance to common paint woes such as cracking, peeling, fading, and yellowing with age and/or high humidity in the room. In short, the paint finish better retains its color and integrity over time. Pick a high-viscosity paint to minimize drippage. 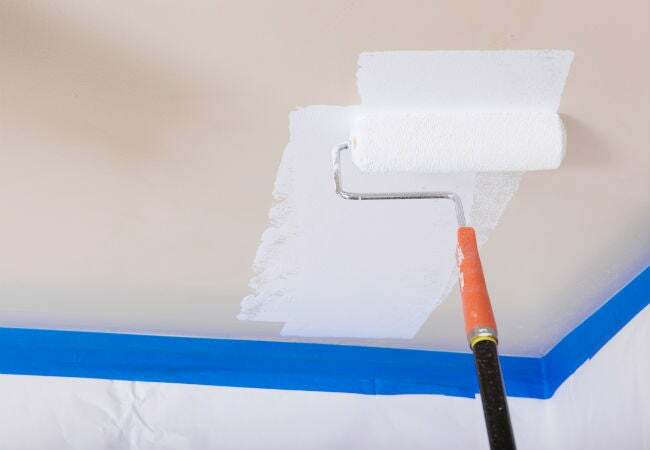 To keep paint from dripping onto you as you coat ceilings, choose an interior latex paint with a higher than average viscosity (a.k.a thickness). The best paint for ceilings has a consistency close to that of thinned-out honey—measured in Krebs Units (KU), this is generally 106 KU or greater. You’ll find the KU measurement in the manufacturer’s specs for any given paint, if it’s not located on the back of the paint can itself. The slightly thicker paint sticks better to the ceiling and stays there until fully dry. 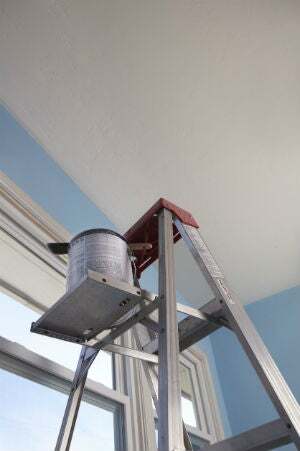 While paints specially formulated for ceilings easily meet or exceed that guideline (e.g., Valspar Ultra 4000 Interior Latex Ceiling Paint, which measures 102 to 111 KU), buying a regular interior latex paint with a similar viscosity (e.g., Valspar Ultra 4000 Interior Latex Flat Paint, which has a viscosity of 97 to 107 KU) will help minimize paint drippage. Opt for a no- or low-luster sheen. Paints with a flat (completely non-reflective) or matte (low-reflectivity) sheen will effectively camouflage ceiling imperfections and allow any painted walls below to take center stage in a room. Between the two, matte is your best bet: It dries into a slightly slicker finish that is slightly easier to wipe clean with soapy water or a Swiffer duster, but still won’t call attention to ceiling cracks, bumps, or seams left by poorly finished drywall joints. You can use paints with a hint of gloss like eggshell, satin, or semi-gloss sparingly on embellishments near or on ceilings such as molding, medallions, or tin ceiling tiles—anywhere you intentionally want to accentuate the architecture. When in doubt, white paint offers a winning finish. Paint colors on the white spectrum—from crisp white to off-white—are the color of choice for ceilings throughout the interior because they harmonize with any wall color you might choose and they create the illusion of amplified dimensions and added light. Just be sure to pick a cool white for rooms with cool paint colors on the walls or a warm white for rooms with warm tones. That doesn’t mean a bold ceiling paint color such as red, navy blue, or black can’t wow: They have certainly been used to heighten drama, accentuate furnishings of the same hue, and create contrast in a room with light-colored walls. These accent ceilings simply look best in spacious, well-lit rooms. If yours is a small or poorly-lit room, beware that the pop of color above might make it look all the more cramped and dim. Buy or DIY texture paint to texture ceilings. Many homeowners choose to apply a texture to their ceiling to give it more depth and dimension than a smooth paint finish affords. As a bonus, its texture can further camouflage imperfections. If you plan to add a simple texture to your ceiling (e.g., a texture resembling sand), prime the ceiling and paint it with a store-bought water-based texture paint such as Behr Premium Plus Sand Finish Flat Interior Texture Paint (available at Home Depot). To apply a texture with more complexity (e.g., the “splatter” knockdown texture resembling a lace veil), use a homemade textured paint: Drywall mud and interior latex paint in a ratio of 1:10 will dry slower than store-bought texture paint. The slower dry time will afford a more controlled application of complex textures that require more time to apply and will make it easier to remove and reapply the paint should you make a mistake and need to redo an area of the texture.